옛 석은사지에 세워진 통일신라시대의 석불입상으로 현재 기와지붕만을 씌운 누각 안에 서 있다. 직사각형의 네모나고 평평한 돌에 새겨진 이 불상은 중앙의 본존불을 중심으로 좌우에 보살입상이 배치된 삼존불(三尊佛) 형식을 이루고 있다. 본존불은 민머리 위에 작은 상투 모양의 머리(육계)가 있고, 둥근 얼굴에는 미소를 띠고 있다. 양 어깨를 감싸고 입은 두꺼운 옷은 가슴에서 U자형을 이루고 있으며, 그 사이에는 ▽형 모양의 띠매듭이 있다. 옷주름선은 오른손 아래에서 3가닥의 음각선을 이루며 흘러내리고 있다. 양쪽의 보살상은 각각 손으로 물건을 감싸 잡거나 합장한 자세이다. 반듯하면서도 단아한 어깨와 중후한 체구 등 신체 각 부분에서 옛 형식이 나타나는 이 삼존불상은 태안마애삼존불상 등과 함께 7세기 석불상을 계승한 것으로 7세기 후반 내지 8세기 초의 작품으로 크게 주목된다. This Buddha triad from the Unified Silla Period was originally built on the Seogeunsa Temple Site but now stands in a pavilion with a tile roof. The Buddha statue carved on a rectangular, flat stone has the main Buddha in the middle, flanked by a Bodhisattva each on the left and right. The main Buddha statue has a small usnisa (protrusion on the top of Buddha’s head) on the bald head, with the round face wearing a smile. The thick sacerdotal robe covering both shoulders makes a U shape in the chest, whereas the belt knot inside the robe is in the shape of an inverted triangle. The pleats of clothes flow down the right hand, making three engraved lines. The Bodhisattva statues on both sides hold something by the hand or join their palms together for praying. This Buddha triad has an old style expressed on each part of body, such as the flat, refined shoulders and dignified body. 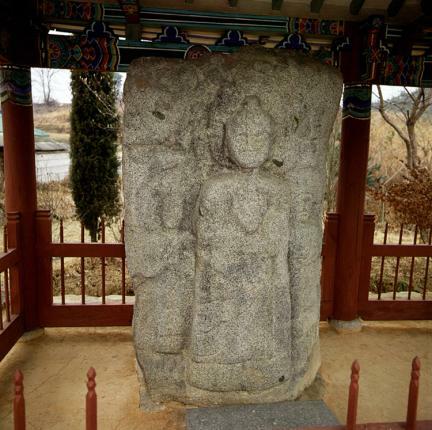 It draws lots of attention as a work from the late 7th to the early 8th century, following the style of stone statue in the 7th century together with the Rock-carved Buddha Triad in Taean.